Despite both sides between them having, in sharply contrasting fashions, dispatched hosts England from the tournament and hence qualified for the knock-out stages, there was nevertheless a significant prize on offer for the winner of this one; to whit a quarter-final tie with a Scotland side who had just made dreadfully heavy weather of squeaking past a previously underwhelming Samoa side. For the losers, their route to the final would be barred by first South Africa then, in all probability, New Zealand. The final score line of 15-6 may suggest a relatively routine day at the office for the Australians, but in truth this was a match Wales really should have won. Right from the outset they had made their intentions clear, dominating possession by capitalising on some sloppy breakdown work by the Australians, although had had to settle for just a successful penalty for their troubles. Indeed, penalties littered the first-half (the majority seemingly conceded by Wales no 8 Talupe Faletau), at the end of which the Australians had ground out a 9-6 lead. Within minutes of the restart, Bernard Foley’s fourth successful kick had moved the score on to 12-6, but it was at this point Wales appeared to find another gear. Indiscretions by both Will Genia and then by Dean Munn in quick succession saw Australia down to 13 men for a spell – a period in which Wales surely had to score a try if they harboured any hopes of winning the match. The chaps in red appeared to spend an age camped out on the Australian line, with the forwards unable to grind the ball home. And on the one occasion the stonewall Aussie defence was overcome, Faletau was seen to have dropped the darned thing in the process. I could not understand why Wales did not use their backs more – simple arithmetic surely meant if their eight forwards could tie up eight opponents in a ruck, then the remaining seven Welshmen should easily be able to conjure up an overlap to breach the five remaining defenders. But the Welsh appeared strangely reluctant to throw the ball out wide. Only once did this actually occur, when George North was set clear down the touchline – but with the line beckoning, indeed within spitting distance, he inexplicably turned infield into the startled and grateful arms of two waiting Aussies. A few minutes later, Wales’s seemingly incessant pressure was lifted when between them Adam Ashley-Cooper and Kurtley Beale pinched the ball from Dan Biggar, and the Australians celebrated as if they had just won the match. Which with hindsight, they had just done. .....is pinched by Wales, but the break comes to naught. Bernard Foley's fourth penalty success puts Australia 12-6 ahead. Gareth Davies gets another second-half Welsh attack underway. A pretty crappy pic, but it does highlight how daft George North was to turn back infield. Kurtley Beale receives the plaudits as Australia turn over possession. 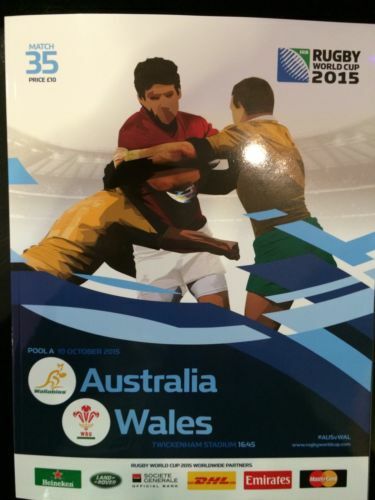 The Welsh forwards don't know it yet, but a huge push by their Aussie counterparts is going to steal the ball. Although Twickenham has enjoyed a number of face-lifts over the last few decades, the old lady is really showing her age. Much makeup in the shape of banners and gaudy paint had been plastered on her visage this afternoon, in an attempt to camouflage the ugly grey concrete facade. But ultimately the exterior still resembles the a product of some East European Post-modern Brutalism school of architecture. Inside, and perhaps this was just because I was in the cheap seats way back behind one goal, the space allocated to each spectator really was at a premium. With the consequence both myself and my neighbours on either side spent the whole match engaged in that odd unspoken game of leg-room attrition. Each of us incrementally opening our legs to capture an additional millimetre of territory, whenever any of us shifted in our rather uncomfortable plastic bucket seats. It was in its way a war as equally brutal and uncompromising as what was going on the field of play.